Did you know that birds love moving water? 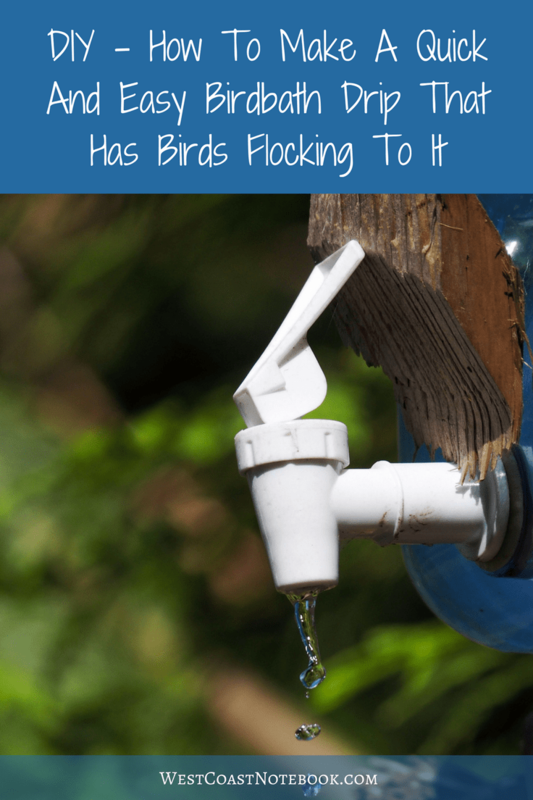 A great way to give them what they love is with this quick and easy birdbath drip. I have found that in the heat of summer, that a lot of birds come to my backyard, not necessarily for the bird seed but for the water. After observing this I wanted to make the habitat as bird friendly as possible so started looking around for other birdbath ideas. Talking with other bird enthusiasts, one thing that they mentioned was the birds liked moving water and to set up a drip. 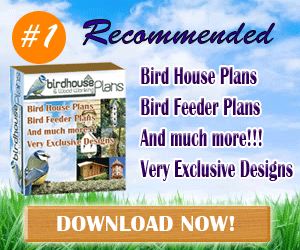 This is particularly useful if you were wanting to attract some additional birds to your backyard like warblers that don’t normally come to your birdfeeders. Basically, it’s something suspended above the bird bath or some other container that drips water down onto the container of water and keeps it in motion. I started looking around and found that there was all sort of gadgets that you could purchase that would create a drip. If you are interested in buying rather than DIYing, you can find some great options on Amazon – click here. But, as I like recycling or reusing objects, I looked around the yard to see what I already had that would accomplish what I wanted to do. This is where you get creative and it might not be pretty like something you would buy, but it can be very functional. Looking on Google for some ideas I found that many people make them out of a milk jug or pop bottle with a hole in the bottom and then hung it up over the bird bath. For me, this wasn’t an option as the limbs on the trees are at a height that I can’t reach, so I opted for a totally unique version. While I was out poking around the shed looking for something that I could use, I found a 3-gallon water jug that I used to use for camping until we started taking a 5-gallon jug with us. The jug was one of those that is horizontal rather than vertical and has a spigot. I thought “this would be perfect“, now how to I set it up? Looking around the yard I spotted the idea spot. Just behind my birdfeeders, there was a large stump that we had put in place for the woodpeckers to hang out and used the top of it for birdseed. Putting the water jug up on the stump, I found a terra cotta saucer from a planter and put it on a tomato stand. I have since changed to a purchased birdbath, but the saucer was all I needed to get going. I never took a picture of it but found this one courtesy of Living the Country Life so you could get a sense of what you might have lying around the yard. Placing it below the water jug on the stump I just needed to find a way to keep the spigot open. As we have a lot of bark mulch in the yard, I just grabbed a piece of wood to hold it open. This is the tricky part. Getting the wood at just the right angle to hold it open to the amount of drip that you want. Depending on the piece of wood I use I might put in two pieces just to get the angle right. Here is what it looks like finished with the new bird bath below it. 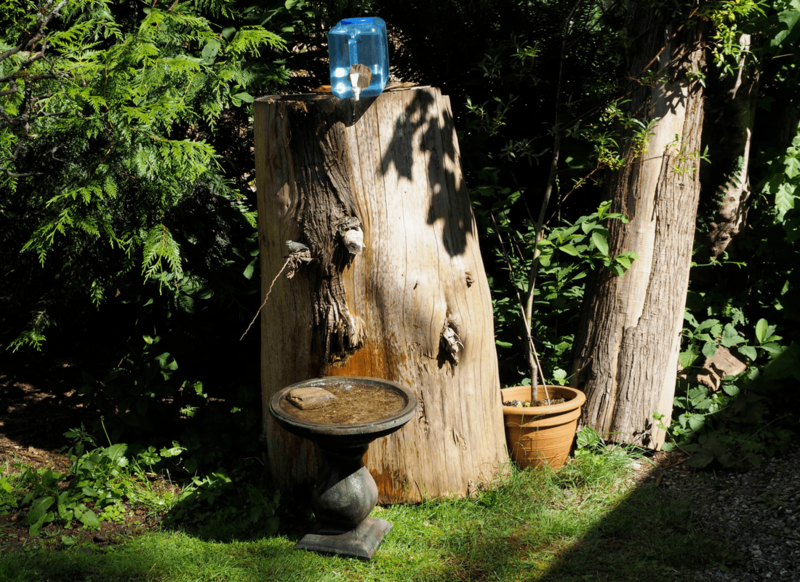 As you can see from the picture, the water jug is on top of the stump with the spigot hanging over. The birdbath below has a rock in it that the smaller birds can use as it’s half in half out of the water. The birdbath has sloping sides so it’s good for robins in the middle and finches and chickadees around the edges. You can also see a stick that is horizontal to the stump about halfway down. I’ve just stuck a twig into a knot hole in the stump to give the birds something to perch on as they get in and out of the bath. I don’t have the drip going all the time but I do have it going usually when I’m out in the yard so I can see the birds that are attracted to it. The birdbath stays full all the time so even if the drip isn’t going the birds have a place to get water. 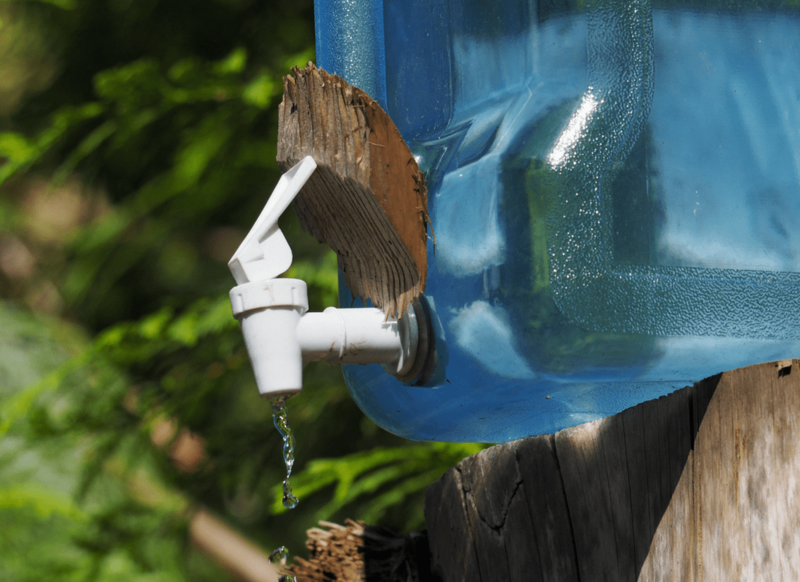 The water jug has a large hole in the top which is great to put a hose into and fill it up. If you wanted, you could just bring it over to a tap and do the same thing. Adjusting the spigot is the next step. I find that I want it slow enough that it doesn’t all run out in 15 minutes but fast enough that you get the sound of water dripping in the birdbath, not just a drop or two here and there. Doing this is two-fold. 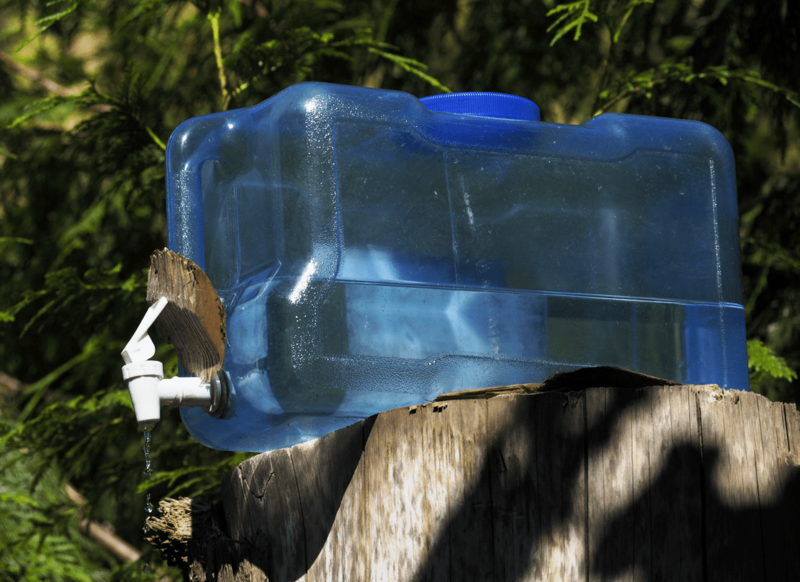 First, the water lasts for at least 3 hours or longer for the birds to enjoy. Second, is that the sound of the water dripping really draws in the birds. They will leave the other birdbath I have in the yard to bath and drink in the one under the drip. Then I will either work in the yard, sit on the deck or in a chair close by the drip and observe the birds that come in and take the occasional picture. I love watching the birds have baths and will do a whole series of pictures at some point showing this. They get their whole bodies involved and put their heads right in the water upside down. The robins seem to enjoy it the most and seem to bathe every day. Here is a list of just some of the birds that I don’t normally get in my yard that were attracted to the bird drip. Once I start the drip I just leave it run until it is empty whether I’m out in the yard or not. The birds might as well enjoy it as much as I do. I only use it in the summer when the days are hot and dry as if it’s wet and cold the birds have other options for water and I find they don’t really use it at those points in time. If you don’t have a 3-gallon water jug, look around for something comparable. Maybe you had an empty wine box or a gallon jug for making ice tea. Here are some great options from Amazon that might trigger your memory as to what you have on hand that might be useful. Also, your local grocery store normally has the water jugs so you could just pick one up next time you’re at the store. Understanding that most people don’t have a convenient stump holed up in their backyard, look for other options. Things like putting the water jug on the deck and a saucer for the birdbath on the ground. Maybe attach it to a fence or put it on something like a rubbermade container. It doesn’t have to be as tall as what I created, but just high enough to give it the dripping sound. And, as I mentioned before, no birdbath is needed just something to catch the water. Look around your yard and get creative. Let me know how you set yours up. Now… I’m off to start the drip and enjoy the birds!